As experienced travelers will know almost every place you visit has something special. It may be the architecture, an event that raises it above others, or just great scenery. Sometimes, however, you come across something really different. And in the case of the Waiotapu (Sacred Waters) Thermal Wonderland in Rotorua - you get several amazing things for your dollar. 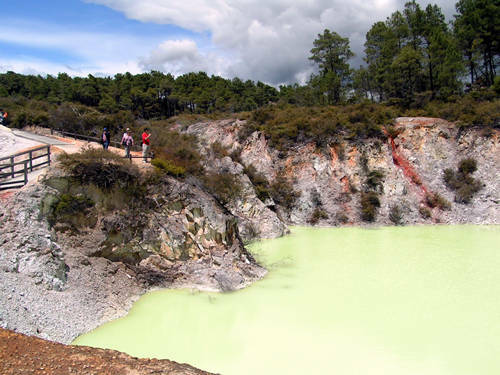 Waiotapu is some 27 kilometres south of Rotorua in the North Island of New Zealand. The area is famous for its geothermal activity - geysers, hot pools, and boiling mud - and you get to see all three at Waiotapu. Firstly you need to get there at about 10am. There is a geyser show at 10.15am and so you need the extra time to get your ticket and then head to the Lady Knox Geyser. With the help of a little soap-like ingredient the geyser will froth and bubble in front of your eyes before whooshing out up to 15 metres high. The display lasts for between 45 minutes and an hour, but the start-up is the really fun part so get there if you can. 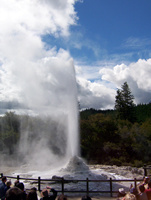 The Lady Knox Geyser is amazing thing No.1. No.2 is a feast for the eyes and is within the Waiotapu park proper. It is about half-way around the paths that lead you through some interesting, though pretty colourless, thermal craters and you come upon it quite suddenly. It is the Artist's Palette and is a large flat area that has brightly coloured highlights of orange, greens and yellows. 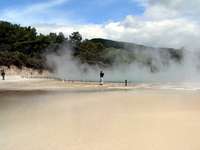 The basin was formed by waters spilling out from the adjacent (and magnificent) Champagne Pool. Over thousands of years the mineral-rich overflow has covered the basin and on a day when the Champagne Pool is particularly steamy it makes the area look like nothing else on Earth. You can walk across the Artists Palette via a wooden walkway and then see The Champagne Pool. This is amazing thing No.3 as it is the largest spring in the district - some 65 metres across and 62 metres deep. It gets its name because the 74 degree Celcius waters within it bubble like my favourite drop of methode champenoise. These bubbles are carbon dioxide. Within the bright orange rim of the pool are things like silver, gold, mercury and arsenic. Take your time here as it really is a visual delight. Next stop The Primrose Terrace, which is New Zealand's largest sinter shelf. Sinter is the build-up of minerals from the springs that solidify to form the terraces. When you do decide to move on you have a choice - going onwards for another couple of kilometres and catching sulphur mounds and impressive waterfalls, or heading back towards the café and seeing amazing thing No.4. That is the Devil's Bath, a crater pool filled with the most vividly-coloured bright green water. On your way to Waiotapu you will have seen signs pointing to mud pools and after you've been through the park's thermal area you should stop and have a look at these remarkable sights. 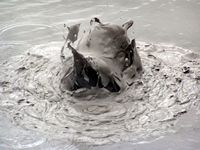 The mud is boiling and looks something like dirty brown porridge boiling on the stove. The heat sends splatters of mud up into the air - sometimes it seems like a table-sized area just explodes out of the steaming water - and it is the perfect opportunity to get some interesting photos. Timing your shutter opening to capture the spouting mud is not easy! 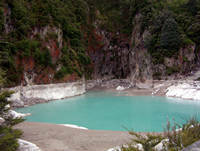 Anyway, Waiotapu is an excellent half-day trip and a must see for anyone visiting Rotorua.